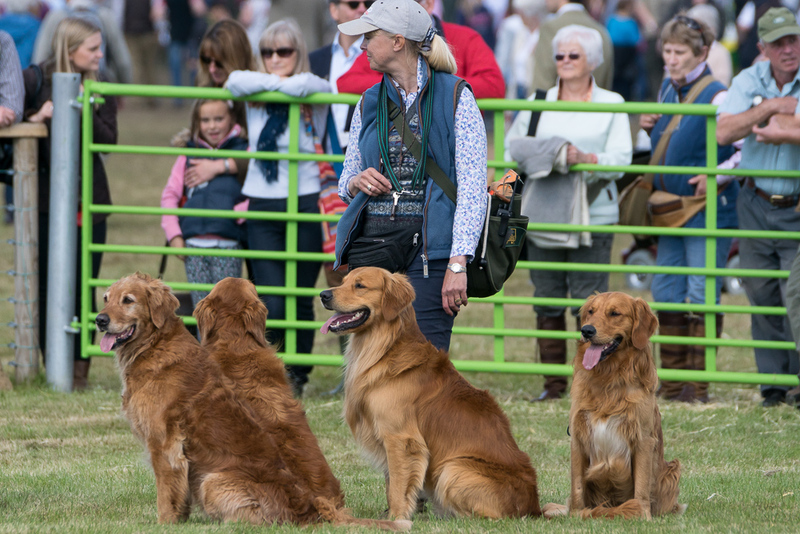 One of the most easily recognisable breeds in the UK, the Golden Retriever is a gundog with boundless enthusiasm. Friendly, loyal and full of fun, the breed makes a great family dog. History of Breed: The first Lord Tweedmouth developed the Golden Retriever at his Guisachan estate. With the improvements in firearms, there was a requirement for a different type of gundog and Lord Tweedmouth set about creating it. He started with a yellow wavy-coated retriever born into a litter of black pups, which he crossed with a Tweed Water Spaniel, a breed now extinct. Also added into the line were the Irish Setter, the Bloodhound and the St John’s water dog of Newfoundland. The result was the Golden Retriever, distinct from the similar yellow Labrador Retriever by its mid-length wavy coat. The Kennel Club recognised the breed as ‘Flat Coats – Golden’ in 1903 and as ‘Retriever (Golden and Yellow)’ in 1911. The Golden Retriever’s stamina, energy, good nature and intelligence make it popular as a guide dog for the blind and hearing dog for the deaf. As a working dog, it is also used in search and rescue and as a detection dog. The breed is a popular family dog. Life Expectancy: About 12 years. Size: A large dog with a height range of 51-61cm and a weight range of 25-34kg. Features: Golden Retrievers have a balanced body with straight forelegs and strong muscular hindquarters, giving a powerful, level gait. The head is also balanced and well-chiselled with a broad skull. The ears are set level with the eyes, which are dark brown with dark rims. The characteristic double-layered, water-resistant coat is flat or wavy in gold or cream with some feathering. Furthermore, a red or mahogany coat is not permissible by Kennel Club breed standards. A few white hairs on the chest is the only permissible variance in colour. 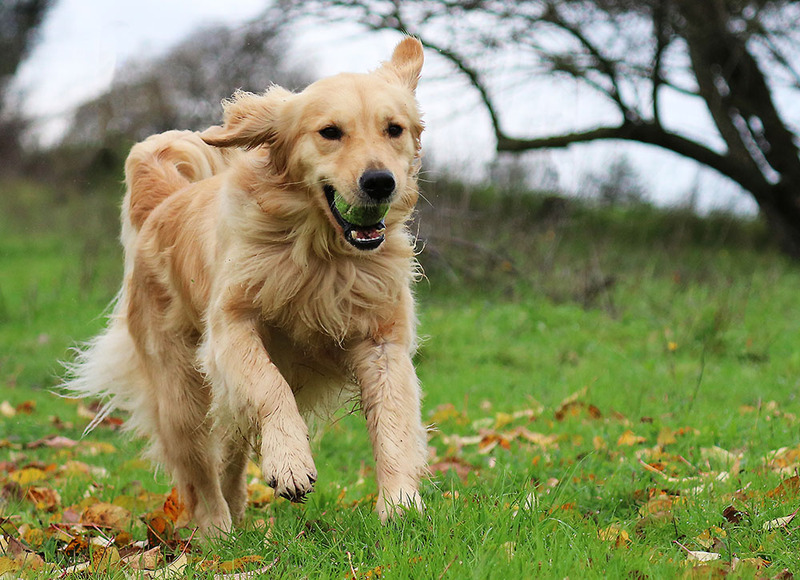 Energy Levels/Exercise Required: Bred primarily as a gundog, the Golden Retriever is a working dog with the energy levels and stamina to enable it to spend long days out hunting. As a result of this, the breed requires plenty of exercise, more than two hours per day. It also benefits from activities that exercise its natural skills and high intelligence. Games involving search and retrieval fit the bill perfectly. This breed also loves being in the water, so exercise near safe stretches of river or at the coast are a good idea. Potential Health Problems: The inter breeding to produce a pure breed has resulted in some genetic diseases affecting Golden Retrievers. Hip dysplasia is very common in the breed. This genetic condition has an early onset if puppies exercise too much or if dogs gain too much weight. Since Golden Retrievers have a tendency to over-eat, it is a good idea to feed to condition to avoid excessive weight gain. A nutritionally balanced dog food designed for working dogs will provide all the nutrients a busy dog needs to keep it going all day. Gilbertson & Page’s Dr John range caters to working dogs. It includes Dr John Titanium for junior and adult dogs as well as an offering of hypoallergenic and grain-free alternatives for those dogs with digestive issues. Cancer is a common cause of death and the breed also suffers from heart diseases, particularly subvalvular aortic stenosis and cardiomyopathy. Golden Retrievers are also prone to joint diseases, such as patella luxation, and eye conditions, such as cataracts. They shed throughout the year, with an additional period of heavy shedding, and can be susceptible to skin complaints. Those considering getting a Golden Retriever puppy should ask the breeder about genetic testing. Owners should maintain regular check ups with a vet. Temperament: The Golden Retriever is intelligent, loyal, calm and eager to please. As a result of this they are easy to train and a pleasure to own. They are also friendly and gentle – not suitable as guard dogs! Child Friendly/Family Dog: Their fantastic temperament makes this breed a perfect family dog. Adults should always supervise dogs and young children and early socialisation is essential to ensure they are comfortable around babies and children. With their high energy levels and love of the outdoors, Golden Retrievers would be happiest in a busy family household. A family that enjoys plenty of activities outside would be perfect. A large house with lots of outdoor space to run off excess energy is a good idea. However, a smaller house near large open areas, such as beaches, moorland, parks or woodland would be just as suitable. Likes: Long walks, water, fun and games, family life. Dislikes: Lack of exercise, being inside for long periods, lack of attention.